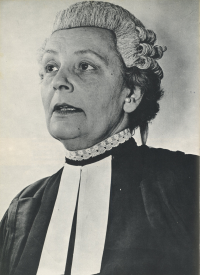 Joan Mavis Rosanove (nee Lazarus) was Victoria's first woman barrister and later first woman QC. Born to a legal family (father Mark Lazarus was a flamboyant, well-regarded solicitor in Melbourne during the late 1800's - early 1900's), Joan studied at the University of Melbourne while doing articles with her father. She was admitted to practise in 1919 and signed the Victorian Bar Roll in 1923. A striking, confident woman, she was a familiar sight around the courts, but soon encountered discrimination when barrister Philip Jacobs offered her his chambers while he went overseas. Resigning from the Bar in 1926, Joan quickly built up a thriving practice as an "amalgam" specialising in matrimonial law and became known as one of Melbourne's best divorce practitioners and ablest advocates. She returned to the Bar in 1949, and was made QC in 1965. Her daughter Margaret "Peg" Lusink was later to become Victoria's first woman Family Court judge.